Our daughter has a personality of her own. Her personality makes her mother and I love her that much more. One of those things that she loves to do is walk in her mom and dad’s shoes. As you probably suspect she wobbles around, falls over, laughs, cries and gets back up again. Sometimes the shoes go on the wrong foot and other times the shoe is completely backwards. Despite all the obstacles I have shared, she continues. I wonder, what is she thinking about? Does she realize who’s shoes they are? Is she imagining that she is the clown at a circus with really large feet? Whatever she is thinking- she loves it. Mom and dad love it also because she looks adorable walking around in our shoes. One morning I was with her while mommy was sleeping and I took the picture you see here. I began to wonder, who’s shoes am I attempting to walk in? Am I attempting to walk in the shoes of success? Am I attempting to walk in the shoes of my family or friends? Am I trying to walk in the shoes of what everyone else wants? 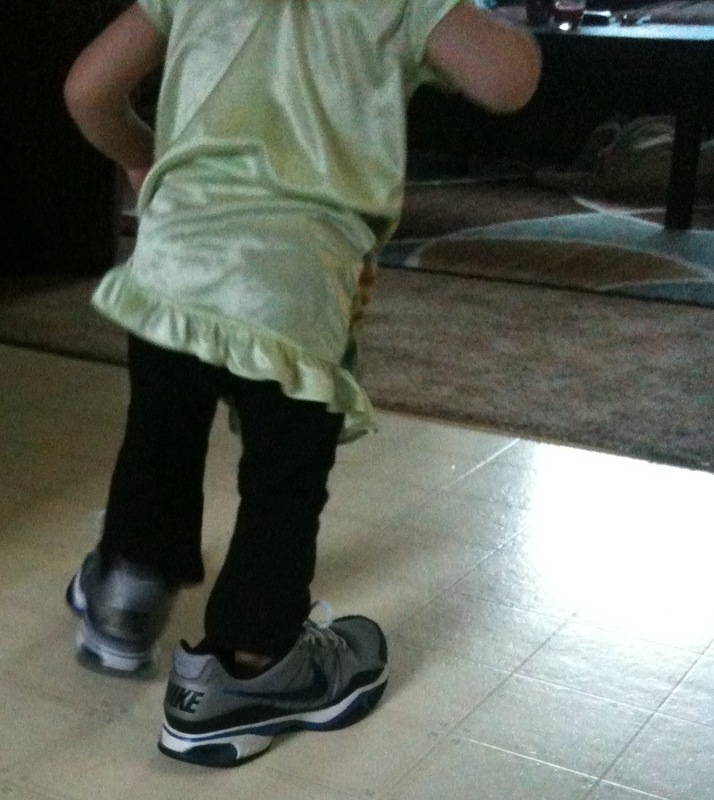 I imagine all of us walking around like my daughter, with shoes that are to big and to heavy. Maybe, instead of trying to walk around as everyone thinks we should, with shoes that are to big and bulky for us to carry, we should walk barefoot. What if I or we walked around barefoot in the path of Jesus? Why barefoot? You see, Jesus did the work and now all we need to do is love Him and love others. Those shoes sound pretty light to me- much like my flip flops that I love! Jesus wants us to walk with light, comfortable shoes. What are your lightest most comfortable shoes? What ways are you wearing shoes that are too heave and too burdensome? That is a great illustration! Thank you for sharing it. Thanks Jonathan! It is amazing to me how God can inspire us through the little things in life. Brian is a husband, father, pastor, painter, and participant in His Kingdom. He has served in ministry since 2004. Brian holds both a bachelor's and master's from Warner University. Brian currently serves as a Director of Youth and Young Adult MInistries and as a Field Coach for Youth Ministry Institute. In addition to the writings on this site, he loves to paint. You can see my paintings by going to LawsonPaintings.com.